Dental implants can restore your smile and boost your self-confidence. So, you want the best Dental Implant Dentist in Sacramento to do the procedure. Dental Implants are a cost effective, permanent solution to repair missing teeth or gaps in your smile while preserving your existing natural teeth. Using the latest technology in unison with the skills and experience of Dr. Jenny Apekian D.D.S., you will receive a minimally invasive dental implant experience and enjoy a permanent smile that will last for years to come. Implants are posts that are surgically placed into the upper or lower jaw bone. The post is made of titanium or titanium-zirconium that are well accepted by the body. The implant acts as support for a dental crown or bridge, and is surgically placed under local anesthesia on an outpatient basis. Thanks to advancements is dental care, dental implants have become an effective way to permanently replace individual missing teeth, several teeth with a dental implant-supported bridge and full upper and lower implant-supported dentures. There are many reasons that have resulted in a missing tooth or teeth including disease and accidents. When considering a dental implant, it’s important to understand that not all implants are created equal and they can vary significantly in terms of quality and reliability. It’s important ask your dentist who manufactures the dental implants they use, how they perform, and life expectancy. At Midtown Dental, you can rest assured that we only use the highest quality, highest rated dental implants available on the market. Missing teeth aren’t just a cosmetic dental problem that can take away from your smile. Several other dental and oral health problems in the future can develop due to the loss of the tooth or teeth. Some of these problems can include bone loss, gum disease, shifting and drifting teeth, bite changes, chewing difficulty, and wearing down of remaining teeth. Choosing a treatment plan that includes implant dentistry provides an incredibly reliable and long-lasting solution for missing teeth. According to the American Association of Oral and Maxillofacial Surgeons, dental implants generally have a 95% long-term success rate. Alternative solutions for missing teeth, such as dental bridges often only last five to seven years, and require shaving down of healthy adjacent teeth to bond several dental crowns together. This puts these natural teeth at risk for sensitivity, pain, and future dental cavities. Implants provide support to replaced teeth. When dentures, bridges, or single teeth are attached to the implants, it prevents them from shifting or slipping while talking or eating. When secured to an implant, the replacements have a more natural feel and function than classic bridges and dentures. Dentures that are attached to the implant are more comfortable and functional. Dental implants keep the jawbone from shrinking due to missing teeth. With proper oral care and regular dental visits, implants can last a lifetime. There are two types of implants that are available as part of your treatment plan. After reviewing your current situation and previous oral care, your dentist may suggest either an implant treatment that involves single tooth implants or an implant supported bridge or denture. A single tooth implant will replace the missing tooth’s roots. The implant acts as a stand-alone replacement and does not involve treating the natural teeth next to it. You feel self-conscious about your smile with a gap. The missing tooth is affecting the way you speak. A missing molar can make it hard to chew properly. Failing to treat a missing tooth can cause the natural teeth around it to shift. It can also lead to bone loss that can cause the remaining teeth to become loose. If you are missing multiple teeth, your dentist may suggest an implant to support a bridge or denture. When there are several teeth missing, an implant-supported bridge can replace them without the need to use the remaining natural teeth for support. With this implant treatment, multiple posts replace the missing tooth roots to act as support for the new bridge. In situations where you need to replace all the upper and/or lower teeth, your dentist may recommend an implant supported denture. Your dentist will surgically place the implants in place of some of the tooth roots. The benefit of implant supported dentures is the ability for the implants to fuse to the jawbone, which will allow for better support of the dentures. Many of our patients who previously had traditional dentures say that the implant treatment gives them a more comfortable feel and lets them bite and chew naturally. The implant treatment process will generally involve three steps. Depending on the treatment plan you and your dentist have chosen, these steps can take several months to complete. At Midtown Dental, the full process is conveniently completed in-house at our state of the art dental office in Sacramento, CA. By bringing in the latest tools and utilizing the latest technologies available in our office, we can offer you the safest, most convenient and comfortable dental implant experience available. When you arrive for you first appointment, Dr. Jenny Apekian will start by taking a 3d x-ray of your jaw and take a digital impression of your teeth. Dr. Apekian will then utilize the latest technologies to plan your implant digitally. This allows her to create surgical guides that results in an implant that is placed with total accuracy ensuring the safest and most effective procedure. At your second appointment, Dr. Apekian will place the implant in your jawbone through a surgical procedure. To make you as comfortable as possible during the procedure, we can offer you a local anesthetic or have sedation options available if you prefer. 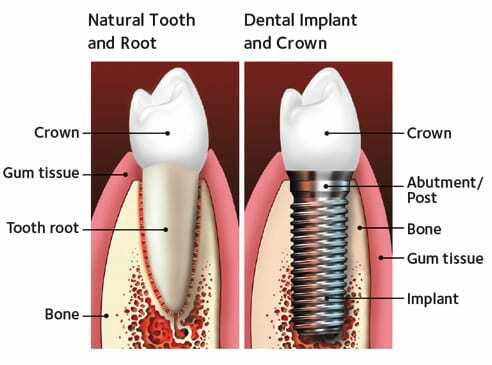 Once the dental implant has been placed, the gum is then secured over the dental implant and remains with a healing abutment to heal properly. Many patients can expect to feel less discomfort than a simple tooth extraction after the visit. You may have experience some swelling and tenderness over the following days as the healing process begins. The healing process between your second and final appointment is generally what takes the most time. While you recover, a process called osseointegration is happening. 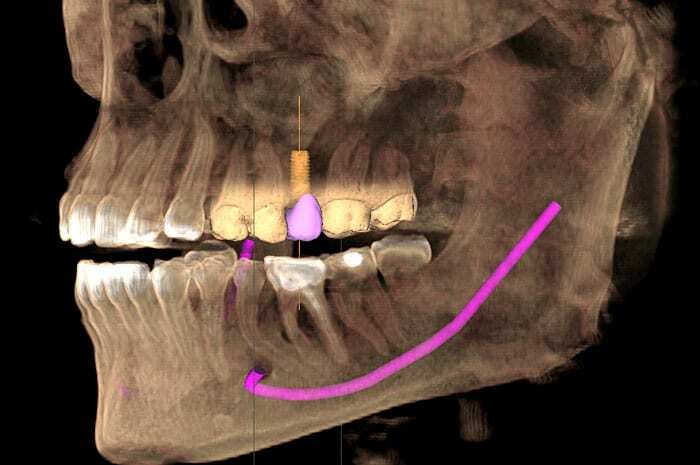 During this process, the jawbone is growing around the implant to strengthen and hold it in place. It can take several months for the implant to become fully integrated to the jawbone. In your final appointment, Dr. Apekian will remove the healing abutment and replace it with a new custom abutment and your new crown, bridge or dentures. You can rest assured your final product will blend in with your natural teeth, mimicking their shape, size and color. We take great pride in the aesthetics, fit, feel and function of all of our implants. After replacing the missing teeth, we love to see the look of joy when you first see your smile has returned. At the end of your appointment, we will review the care and maintenance that implants require. Like all other teeth, proper oral hygiene and maintenance are essential for long lasting dental implants. Regular dental visits every six months, flossing at least once a day and brushing at least twice a day is critical to preventing plaque from forming around the implant. Our dedicated team of dental hygienists at Midtown Dental in Sacramento, CA will help you care for and clean your dental implants to keep your gum tissue healthy. The right candidate for an implant treatment is generally in good health and has adequate bone in the jaw to support the implant. Your age is less of a factor than overall health for dental implants. In some cases, patients have experienced bone loss as a result of the missing teeth. This can reduce the needed jawbone for the implant. There are surgical options including a bone graft or sinus lift that may be available to you to build the jawbone back up. Patients with health issues, such as diabetes and leukemia may experience slower healing after surgery. It is important to discuss your health history with your dentist if you are considering any dental procedure. When you first visit our office, Dr. Apekian will be able evaluate whether you are a good candidate for dental implants. If you are not, she may be able to make alternate recommendations based on your situation. At Midtown Dental, we understand that paying for dental implants can be a concern. Fortunately, thanks to advancements in dental technology, the cost of dental implants has significantly decreased over the years. Our dental office will work with you to find the most cost effective dental implant solution to make sure you receive the oral care you need. Financing options are available and our staff is happy to explain your options. If you are interested in a dental implant, have questions about the process or the cost of implant treatment, please do not hesitate to Contact our Midtown Dental Office and implant dentist Dr. Jenny Apekian. Dr. Apekian and the whole team at Midtown Dental are fantastic. There is no better dental office in Sacramento. They are the most honest and knowledgeable office I have ever been to. They have the latest technology and the coolest equipment. I needed a dental implant and Dr. Apekian did an incredibly thorough consultation and explained the entire process and treatment in detail. Call today at (916) 441–5800 to learn more about our Dental Implant services.